Say it ain’t so. Roger Federer, saving match points. Not one or two, but five. The Swiss maestro was tested and needed a third set tiebreaker to hold off a valiant effort from Leonardo Mayer, who was an unlucky net cord away from defeating his idol. The crowd chanted “Roger, Roger…!” while going nuts at the drama that unfolded late into the third set. Mayer earned the first break of the match, only to see it slip away as Federer clawed back from 3-5 down to win the first set 7-5. The story repeated in the second set, except this time, Mayer broke the Swiss again to force a decider. No breaks of serve ensued, as the two were locked in until the 33-year-old Swiss served to stay in the match at 4-5. Facing two match points at 15-40, Federer saved the first with a stick volley and a net cord in his favor. A whipping backhand winner while moving to net saved the second. Despite pushing the match into a final set tiebreaker, it was Mayer instead who jumped to a 5-2 lead. The 17-time grand slam champion came back again, but not entirely. First was another two match points to save, down 4-6, and a fifth match point at 6-7, which he saved with clutch serving. On his first match point, the Swiss maneuvered on defense and then flicked a backhand lob for a winner. Raising his arms in delight and relief, Federer defeated Mayer 7-5 3-6 7-6 (7) in 2 hours 41 minutes. With a 57-10 record in 2014 (best on tour), he will face Roberto Bautista Agut in the third round on Thursday (8pm Shanghai/8am ET/5am PT). @RogerFederer "towel please!" 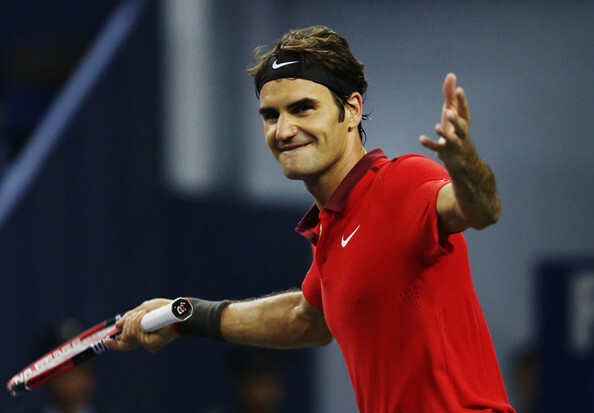 2014 #Shanghai #Rolex Masters (#SHRolexMasters). Get the latest news at federerfan07.com.